Everyone can jump, asults, teenagers (signed parental consent), elderly except for medical reasons. Should there be special knowledge for tandem skydivinbg? No, a good physical condition, a good dose of courage and let yourself be guided by our team of professionals (lien) trained and recognized by the french civil aviation autority. To this a preparation of 15 minutes before the jump will ber enough. For your tandem skydiving, you will be taken by a qualified professional tandem pilot, having several hundred jumps to its credit. 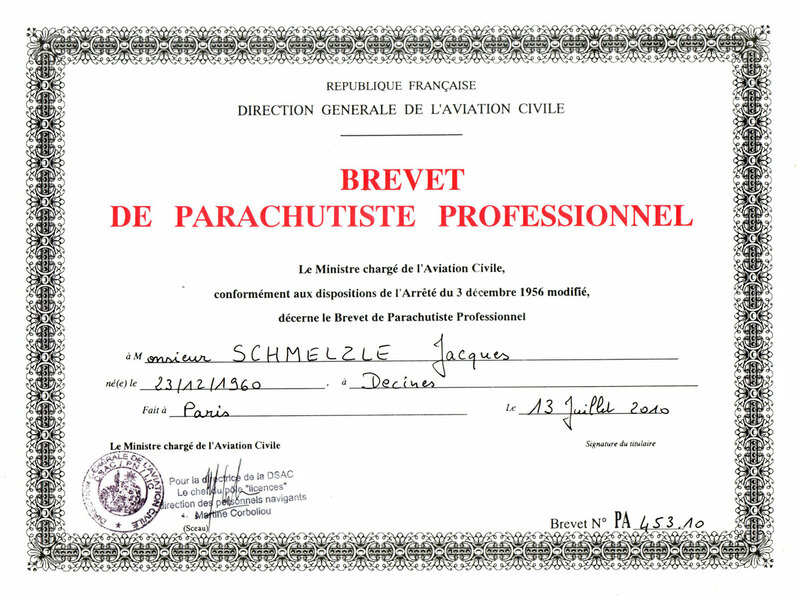 The parachutes, which are folded by professionals, are equipped with a security system. On reservation depending on the weather conditions and the opening of the jump platforms. By printing the booking form and returning it completed with a deposit of 100 euros. How to offer the tandem jump to a relative, a friend? Simply fill in the reservation form, specifying that it is for a gift. Payment is then made in full and the person will receive a gift ticket at the address you have indicated. Discreetly. • Either it is theVIP option. Shots are taken by the cameraman as well as by the tandem pilot; all shots and sensations are recorded. A superb editing is made with a mix of the two kind of views. How to dress for a tandem? Fore everyone, jeans or pants not too tight with a top, sweatshirt type with a pair of sneakers. Special glasses will be provided. Can we jump with glasses or contact lenses? OF Course! Report it at the beginning of the briefing. A suitable pair of glasses will be provided that you will keep on your eyes for the duration of the jump. Are there any weather constraints? Unfortunately yes! The main constraints are the wind, the rain, the visibility. If the weather threatens safety, your jump will be postponed. what happens if the weather conditions are not good? It is recommended to call us to get a confirmation of the weather before you move. If the conditions are bad, you can book for another date. Do we stop breathing during free fall? No, you breathe normally in free fall. What is a wrist camera or onboard camera? This is a video made by the tandem pilot who carries the camera on his wrist. He takes shots more closer than a cameraman and the shots are taken to the ground. As a result, we have the first reactions at the parachute deployment. At the editing, you have exactly the same shots as with a cameraman because we make shots of the briefing until the return..